As prices continue to rise, this date travels further back in time. 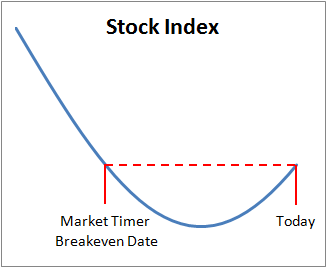 Apart from a few bumps in the TSX chart, the breakeven date is now back to October 6. Not too many market timers who jumped out of stocks during the downturn managed to do it before this date. Curiously, a few people I know who jumped out of stocks seem quite unconcerned by all this. They are content to wait until “things calm down,” but fail to see the fact that they sold low and are waiting to buy high. An interesting extension of this would be to ask a few market timers how much of a "recovery" (rise in prices) they would need to see before they get back in... add another 10% to the price level and the date will go back even further. Silicon Prairie: Maybe I'll try asking that question the next time the subject comes up. I suspect that the time to get back in for these people has more to do with how they feel than price levels. I would have thought most people would have jumped back in by now. I guess it's not easy to change one's mind about something as emotional as money/investing. I'm glad I ride out the bumps, since it's even harder to predict the stock market than the economy.